Hi there friends, hope everything is going wonderfully for you today. 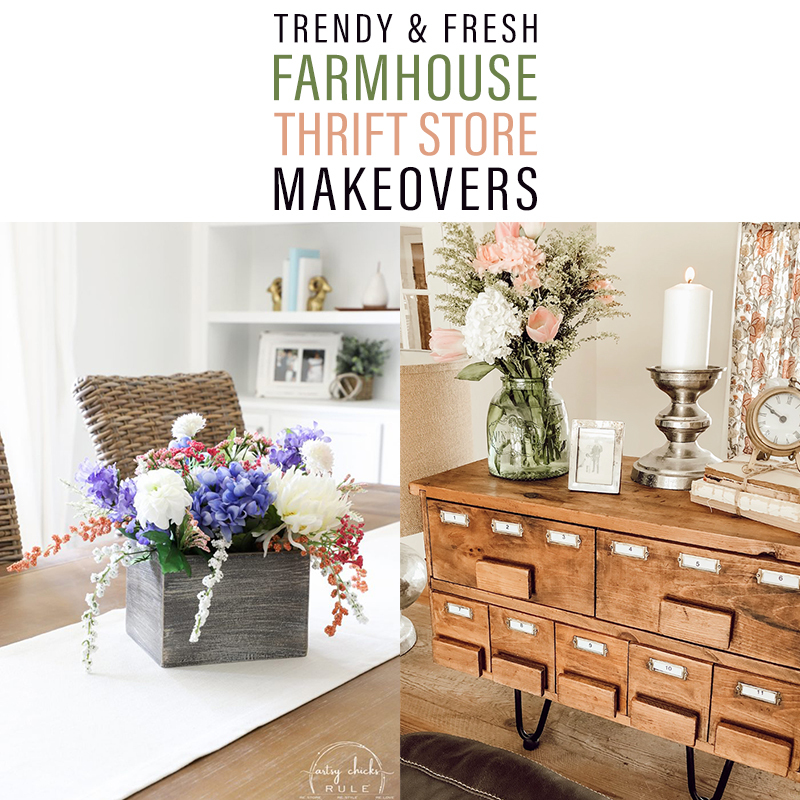 It is once again time for some Trendy and Fresh Farmhouse Thrift Store Makeovers. This weeks selection is so much fun and each and every piece will make your Farmhouse Home Decor Smile. 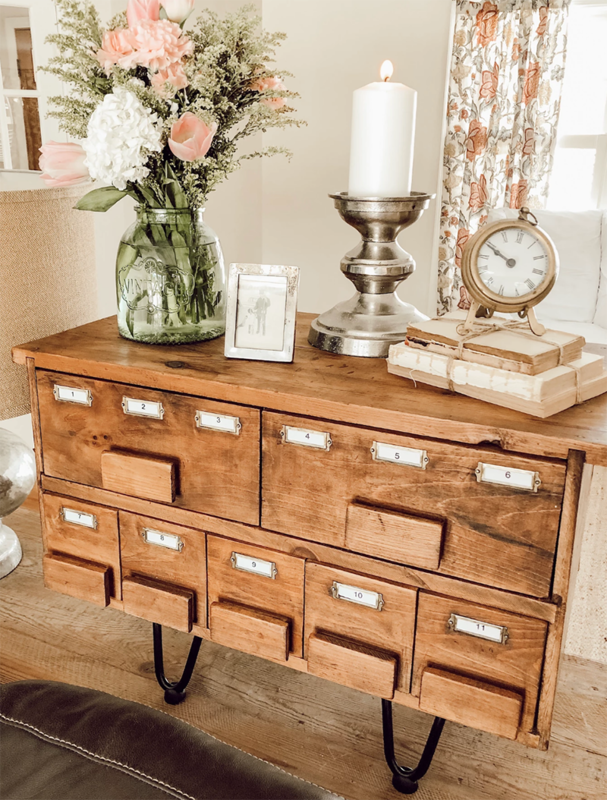 You will find a fabulous Card Catalog Makeover… a gorgeous Upcycled Drawer Centerpiece… an upcycled Farmhouse Chalkboard and so much more. So now is the time that you sneak off to the most comfy space in the house with your delicious cup of brew and get tons of inspiration for your next Thrift Store creation. It’s always fun to stop by Homeroad and see what Susan has been up to. Well today she is showing us how she took a Thrift Store Basket and turned it into the Farmhouse Beauty! It went from drab to Farmhouse Fab! 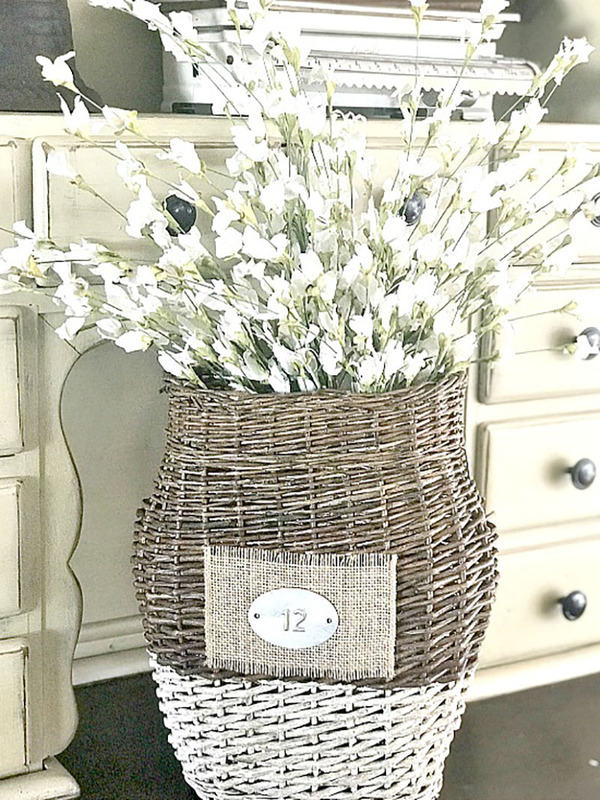 Check out her simple tutorial and maybe you will find a basket at your Thrift Shop or Garage Sale that would love a Makeover like this one! 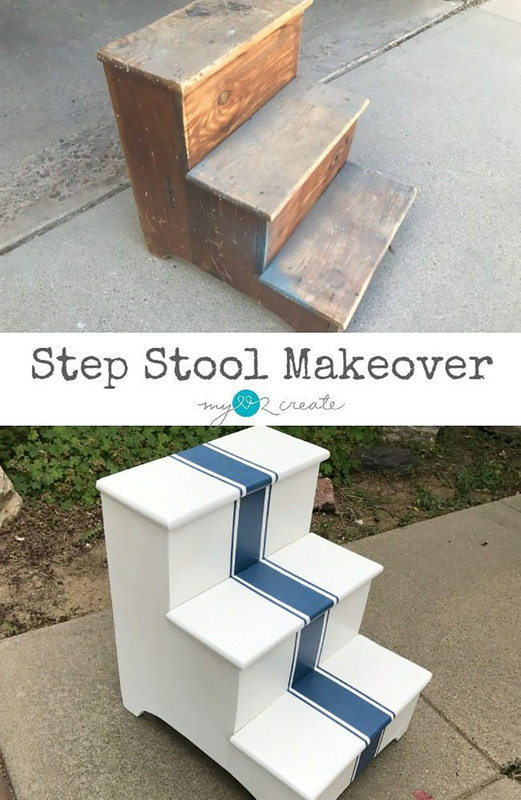 Gail over at My Repurposed Life is going to show you how she took a Thrift Store Step Stool that had had A LOT of wear and tear to say the least and magically transformed it into this amazing Grain Sack Stripe Stool that would look fabulous just about any place it is put. She shares her techniques so we can use them on Thrift Store finds we bring into our lives. Check it out. I LOVE this creation that Larissa over at Prodigal Pieces put together. What I love so much is her (and her Mother’s) imagination and foresight. 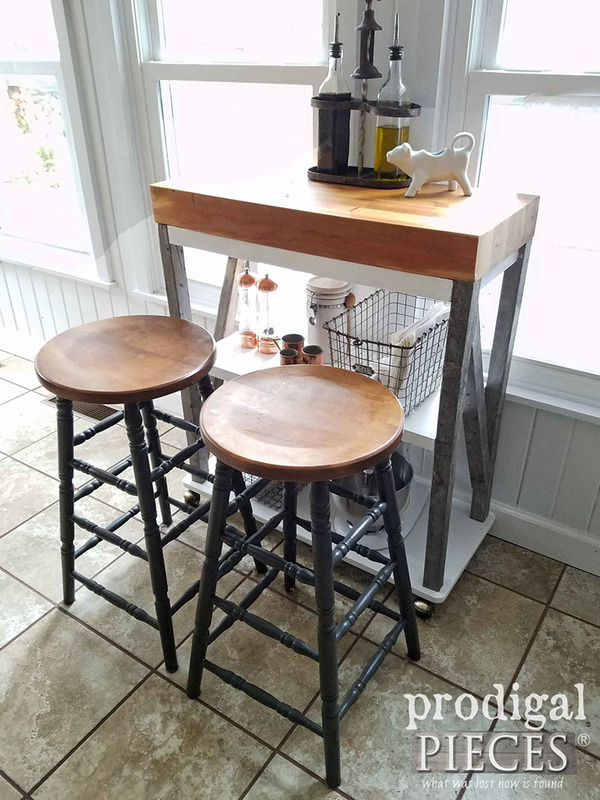 Her Mom spotted a piece at a Garage Sale… someone attempted to build a piece of Butcher block and her Mom thought she could use it… so she called her over. Of course Larissa snatched it up for $1!!! Well…you are going to see how that $1 find turned into this wonderful Farmhouse Butcher Block Cart. So when you are shopping around at your Thrift Shop… Garage Sale… Flea Market… sometime you might come across something that just might want you to make something else out of it! It’s fun to give something new life… be inspired and then create! Here we are at Confessions Of A Serial DIYER and Christy has once again reaffirmed my LOVE for Re-Purposed Drawer Projects! She picked up two little drawers at her Thrift Store about 2 months ago for $.99 a piece… just look at them now! Talk Fabulous! 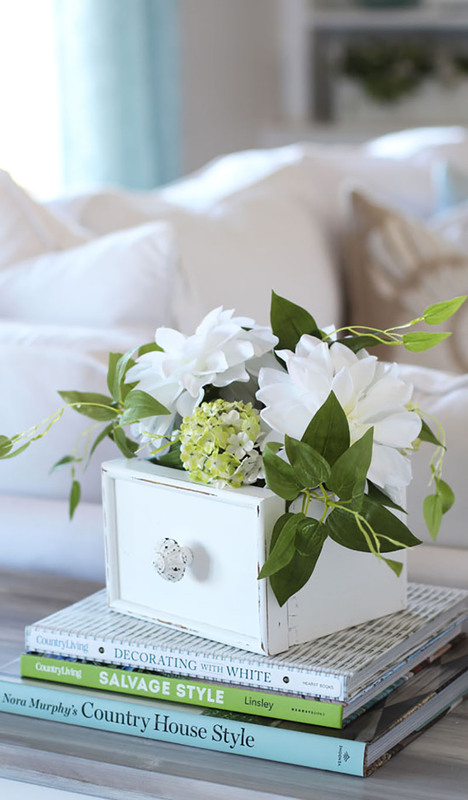 Drop by and check out her technique for the painting and she shares the step-by-step for her beautiful flower arrangement (bonus : ) … this could be what you were looking for for your Spring Time Table… Vignette…Bookshelf and more. Don’t let drawers pass you by!!! Here we are checking out what to do with Thrift Store Baskets once again. 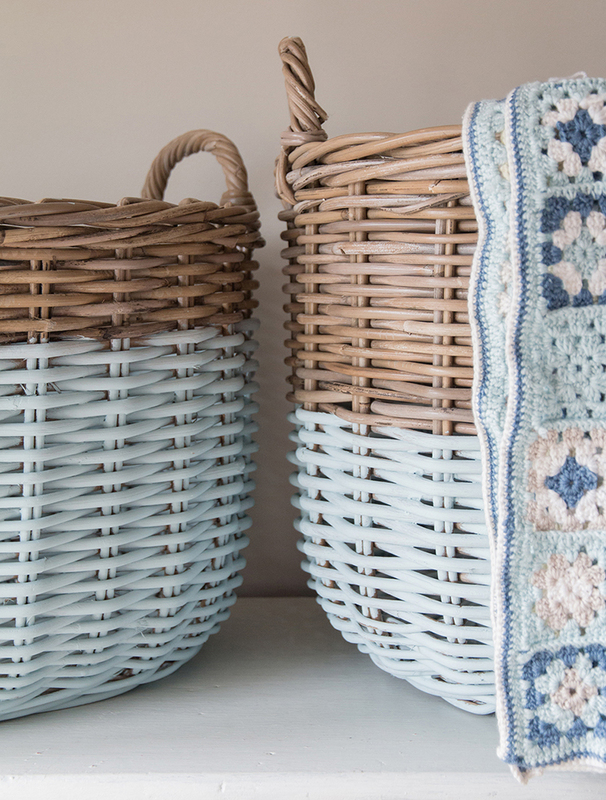 Well what Laura Ashley loves to do is use paint… don’t these baskets look totally dreamy? They are sensational for storing items in style. From clothes to blankets. 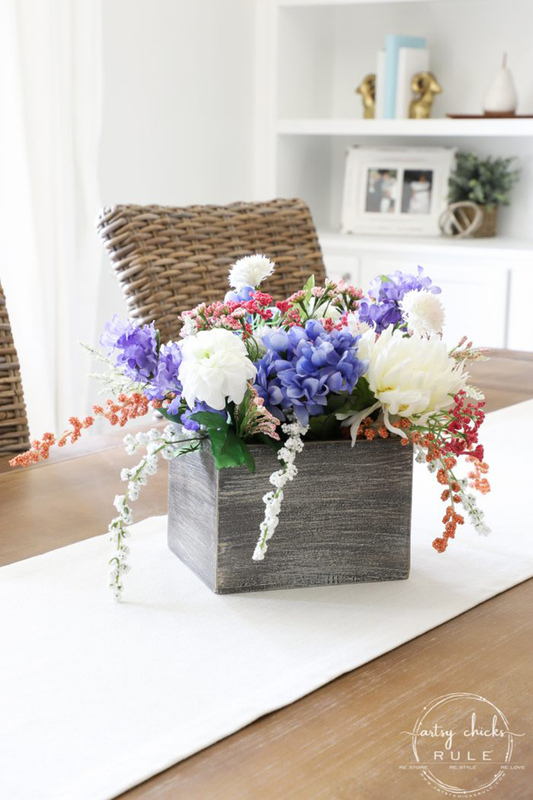 You can bring new life to so many baskets with a simple swipe of the paint brush. So when you are at the Thrift Store… really keep those eyes open… even though some of the baskets may look a bit worn… you can breath new life into them. Jamie over at the amazing Anderson + Grant took a visit to her Junk Store and brought a few items home… a board with hinges on it and a few other things. She had no idea what she was going to do with it. Well… she certainly came up with something totally Farmtastic! Come and see how some pieces of junk went from Trash to Treasure! 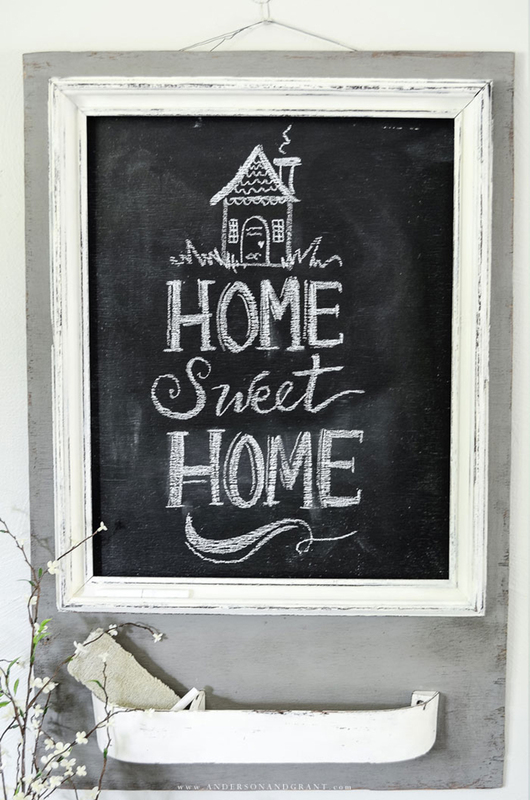 I am loving this Chalkboard and it is certainly a one of a kind. What would you do with a dated old Recipe Box??? Well Nancy over at Artsy Chick Rule decided she would turn her find into a Fresh Farmhouse Flower Box and it worked perfectly. Do you have a little box? Want to transform it? Come on over and let Nancy show you how. 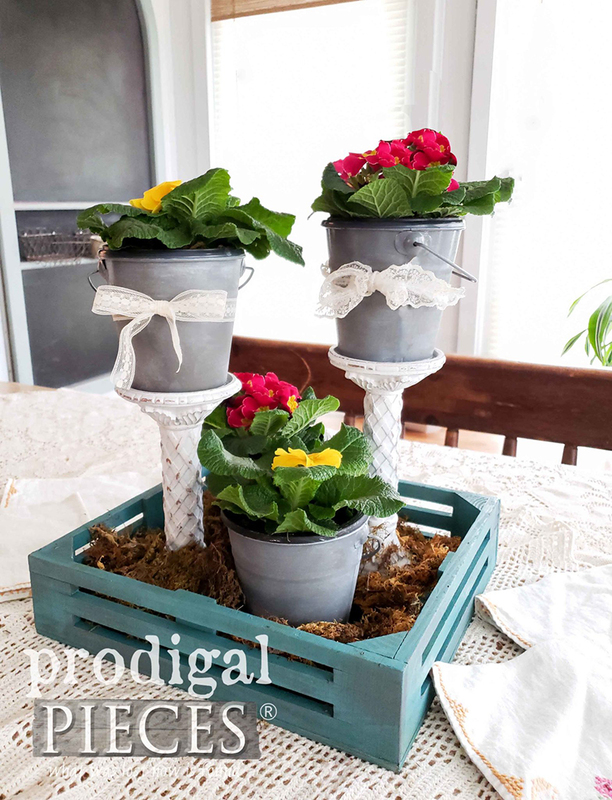 Larissa is going to show you how she made this sweet Spring Time Centerpiece with Thrift Finds she accumulated. Talk about thinking out of the box but in the box!!! I think you will be impressed on how this all came together. So as you are shopping up and down the aisles… think about how some pieces would work together… who knows what you all come up with. Visit Prodigal Pieces for more information and fun! Angie over at Knick Of Time has a way with Thrifted Items! 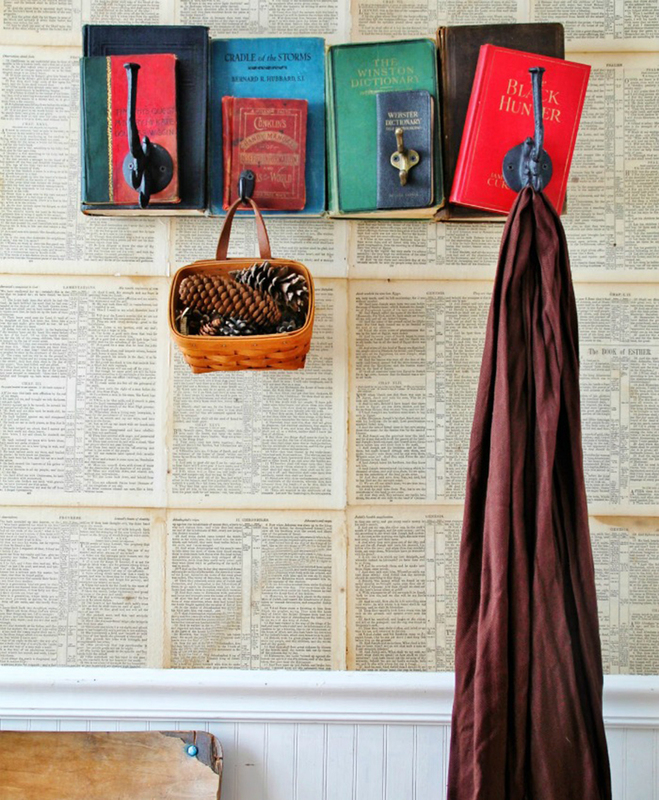 Come and see how she turns some Old books and hooks into a unique and whimsical Coat Rack! Stop by… Angie shares her DIY! Ok… this is not exactly a Thrift Store find… Ann (Dabbling and Decorating) found it in her Parents garage. It was a bit beat up and needed work. It didn’t have legs either. She decided to stain it because all of the fixtures were permanent and it would be difficult to paint. Well… come and watch her process… all I can tell you that the end result is amazing!!! You are oh so welcome Ann! Sending tons of hugs and wishes for a wonderful evening!